Bring the popular trend of the bar necklace to your finger with the Bar Name Ring in Sterling Silver. This signet ring style dates back centuries, but it’s more popular than ever today. 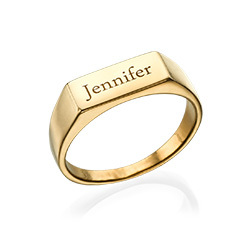 The sterling silver bar that sits at the top of the ring can be engraved with your name, the name of a loved one or a word that is meaningful to you. You are only limited by your own creativity. This statement ring is sure to draw many compliments from friends and family so get ready.